The Money Advice Trust and Advice NI are delighted to announce that Wiseradviser Northern Ireland has gained accreditation from the Money Advice Service, as part of their Quality Framework for Individuals, in the Initial Contact, Support Work, Advice Work, Casework/Specialist, Court Representation and Supervision debt activity sets. The diagram below shows what courses form the Wiseradviser Northern Ireland pathway (the brightly coloured boxes with white text) and what the relevant optional courses (the white areas with green text) are for each debt activity set. Click the diagram to view a larger version (PDF). 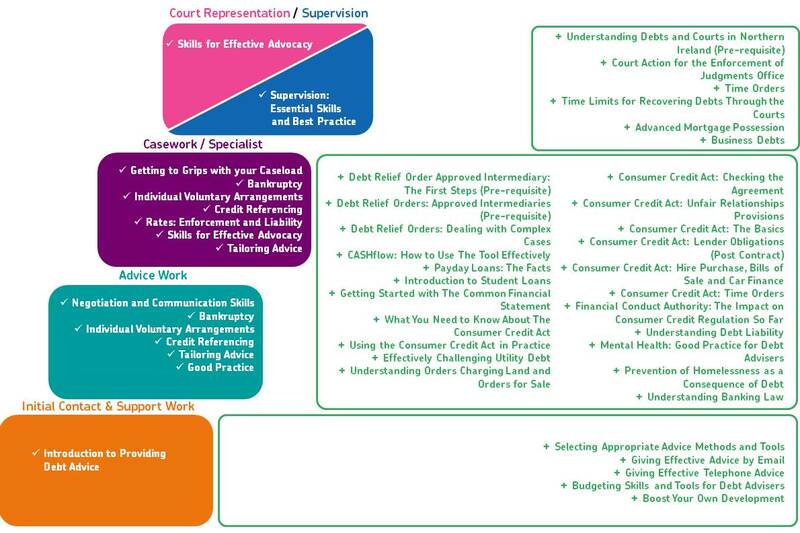 For example, if you are new to debt advice, you would complete the Initial Contact & Support Work core course (in the orange box), Introduction to Providing Debt Advice first, then complete any of the optional courses, at that level, before moving up to the next learning pathway.